*Katharina Frei* - Kreatives Sammelsurium: Cheers to You! Today's card is for Cute Card Thursday's challenge "Wine and Dine" (how adequate for my evening tonight :) I chose a beige/pink/black colour combo, because I love the elegant flair of it. The image is from Hänglar and Stänglar's New Year collection. I coloured it with Copic Sketch Markers and put some crystal effects on the glass. I cut it with Spellbinders long rectangle Nestabilities and matted it with 2 layers. The sentiment is from Whiff of Joy's Party Sentiments collection. 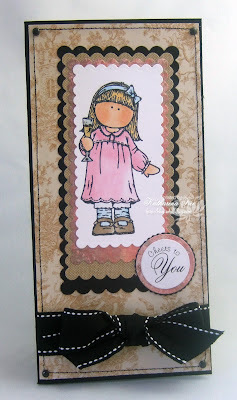 Meine heutige Karte ist für die Cute Card Thursday challenge mit dem Thema "Wein und Speise" (wie passend zu meiner Abendgestaltung ;) Ich habe eine beige/rosa/schwarz Farbkombination gewählt, da diese einen sehr eleganten touch vermittelt. Ausgestanzt habe ich das Hänglar Mädchen aus der Neujahreskollektion 2009 mit Spellbinders long rectangle Nestabilities. Coloriert habe ich mit Copic Sketch Markern. Der Text ist von Whiff of Joy's Party Sentiments collection. I hope you'll also have a lovely evening. Take care! Ich wünsche euch auch einen schönen Abend! This is really beautiful!! I love this image and the color palette is great! Hi Katharine Beautiful card and enjoy your evening out. Wow Katharina, what a beautiful card. Gorgeous card! Have a great evening. Beautiful colouring and such a lovely design. eine sehr süße Karte, wunderschön. Ich wünsche Euch beiden viel Spaß heute abend. This is a beautiful card! I love the tall cards and this image is adorable! I hope you have a wonderful date with your husband!! It's great to be able to get out! Die Karte ist klasse. Ich wünsche Euch einen wunderschönen Abend, viel Spaß. What a gorgeous card, Katharina! Great colouring. SURE you still know how to go out on a date! I hope you have a WONDERFUL time! oh yes, Great Card, and I love the colors you've chosen! Have a great evening, you deserve a break! Wir möchten dir gerne einladen für unseren Create4fun Challenge. 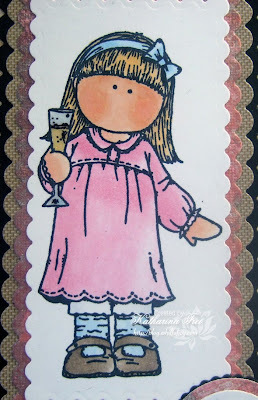 Siehe www.create4fun.nl und geh zum "challenge"
Super cute card!! Love that sweet image! Hope you had a fabby evening with your hubby! It's always great to get out together! Gorgeous card Katharina and I hope you and hubby had a lovely evening out! Awwww.....so cute! Love the colour combo!